Robert "Rob" Clay Rivers is a program director at the National Institute of Diabetes and Digestive and Kidney Diseases (NIDDK). Rivers’ commitment to increasing the representation of African-Americans in Science, Technology, Engineering and Math (STEM), accomplishments and efforts in outreach make him a change agent for African-Americans. Jennifer Evans (Haliwa-Saponi Tribe) at National Institute of Environmental Health Sciences (NIEHS) and Ashley Wells (Occaneechi-Saponi Tribe) at the office of Equity, Diversity, and Inclusion (EDI). Ashley Wells: What’s your Tribal Name? Ashley Wells: Where were you born? Ashley Wells: How important is community outreach to you? As Malcolm Gladwell observes in his book, The Tipping Point, "The success of any kind of social epidemic is heavily dependent on the involvement of people with a particular and rare set of social gifts." 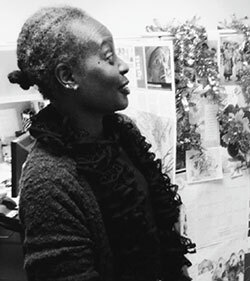 Alfreda Layne is such a person, and as such, serves as a catalyst for change at NIH.